Actually Jake, he ran the first half in 1:22:10 and the second half in 1:22:07 so he did negative split. Anyways, great job Max. Go do some bikram yoga and get a starbucks latte and use that belt thing that shakes out your legs and take an ice bath and email Michael Wardian and tell him how he should only focus on the trials and do all the other stuff you love to do. Good work Max, even race. Scott should start writing magazines (the LT=LT write up was hilarious... Max write up is a close second). I'm taking a bus from Chinatown at 1 pm for NYC this Friday. Staying with high school friend Aileen in Hoboken... who's sister Emily Conlon is engaged to Carl Dusen who is running this Saturday who Klim, Christiam and I ran with, who is good friends with Wiggy. Small world, running brings good people together. Great race, Max! In homage to your performance I am working on my Max Lockwood Superhero Halloween costume. I have the red basketball shorts all ready to go. Jake, Jason, Scott, and Megan all ran well at the Goblin Gallop this morning. 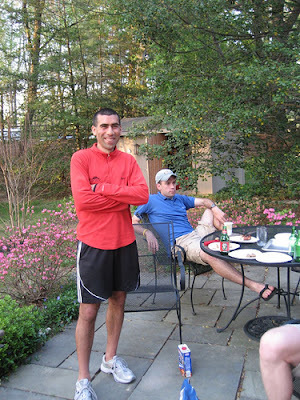 Jake is racing himself into shape, cutting 10+ seconds off his time at the Baltimore Marathon 5k a few weeks ago. I'm sure the race report is soon to follow (he is napping right now). Scratch that. I am now dressing up as the infamous Dane Rauschenberg, who just ran his second marathon PR this month (2:55:31)!!! Way to go! Max, Very nice run..very consistent. And Dane.....A PR with a pee stop...way to go! Max...you running New York next weekend for a new PR? nice work max! I wish you a speedy recovery. Matt, how did you know about that?